Satan's Power Broken is below and simply click on the links above to go to the other pages. Lived in tombs instead of a house (Mark 5:5, Luke 8:27). Man could not contain him (Mark 5:3). He could literally break chains (Mark 5:4). He did not wear clothes (Luke 8:27). He cut himself with stones (Mark 5:5). With absolutely no doubt, this also happens in the world we live in today. When we let devils into our lives, they wreak havoc. But that all changes when Jesus comes. Hallelujah! When Jesus came (Mark 5:2), the demonic spirits could not stop Legion from running to Jesus and worshiping Him (Mark 5:3,6). The devils knew who Jesus was - the Most High God (Mark 5:7). We clearly see though that when the Lord rebukes demonic spirits, they must leave (Mark 5:8). Know that Jesus is God. Ask the Lord to rebuke all demonic spirits from our lives. Will the demons want to leave? No they will not, they will want to stay around (Mark 5:10-13). They have minds, they can reason and are always looking for a place to live. It is important to be firm, constant and consistent in using each and every one of the strategies listed above. 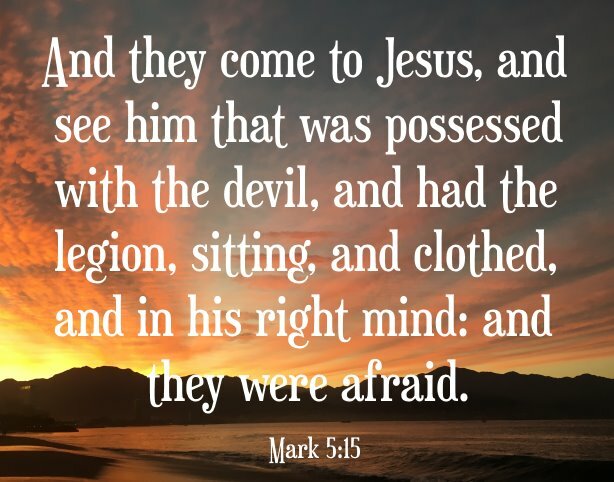 And they come to Jesus, and see him that was possessed with the devil, and had the legion, sitting, and clothed, and in his right mind: and they were afraid (Mark 5:15). It will work for us too!